rocky's bru: Asia Sentinel pun bantai Anwar? Updates: Syed Akbar Ali on the friends Anwar keeps (Yusuf al-Qardhawi, a village idiot from Egypt who married a girl younger than his youngest grand daughter; Al Gore, conman and genocidal maniac par excellence; and Wolfowitz, arch neo-con who has the blood of hundreds of thousands of Iraqis on his hands) and his RM7 million mansion in Selayang. Depan belakang sapu. 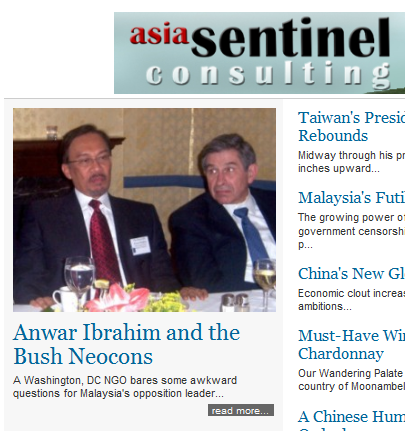 Dulu dia bantai Najib Razak, kali ni Asia Sentinel menyiarkan berita tentang Ketua Umum Anwar Ibrahim, hubungan intimnya dengan Bush neocons dan putar-belit Foundation for the Future. Anwar sendiri pernah beriya-iya bikin hyperlink pada cerita Asia Sentinel masa portal tu bantai Najib bulan Oktober lepas. Tak tau lah kalau artikel Anwar Ibrahim and the Bush Neocons - A Washington, DC NGO bares some awkward questions for Malaysia's opposition leader akan disiarkan di blog Anwar. Anwar has previously disavowed any US funding of the organization, established in 2005 as "an essential front on the global war on terror" and part of President George Bush's "freedom agenda" to promote democracy and reform in the Middle East and Africa. Anwar served as chairman and acting president of the organization's board in the period when he was out of politics following his incarceration on corruption and sexual perversion charges. The Government Accountability Project report lends considerable ammunition to Anwar's opponents in the United Malays National Organization, who have long charged that Anwar was connected to the US Central Intelligence Agency, although neither the CIA nor the US government as a whole has ever exhibited any particular desire to bring down the Malaysian government, and in fact considers Malaysia, as a moderate Muslim democracy, to be one of its staunchest allies in the region. In particular, UMNO Youth Chief Kairy Jamaluddin called attention to Anwar's statements disavowing US funding of the foundation and demanded that Anwar explain himself. He accused Anwar of misleading the US government in a memorandum of understanding saying the foundation had agreed to get other countries to commit funds to match those the US government was providing. "For me, it is a serious matter that the opposition leader has tried to mislead the US government to get grants for a foundation that he was chairman of," Khairy told the Malaysian newspaper The Star. An Anwar associate said the opposition leader would decline to comment, adding that there was little to be gained by saying anything about the matter. Nonetheless, he characterized Anwar's role as blameless. "There is nothing wrong going on," he said. "This is part of the campaign to get Wolfowitz out of the World Bank and to do so they threw Anwar under the bus." p.s. Kalau nak baca versi Bujai, pergi kat sini. Puji KJ mamat ni: "So, Member of Parliament for Rembau, Khairy Jamaluddin must have done his research well enough before establishing the story at the Dewan Rakyat." Pasquale pun ada cerita di sini, tapi tak puji siapa2 kecuali Tun Dr Mahathir. but any news from the french investigation on how najis bantai the rm500millions? AND UMNO IS STILL USING TAXPAYER MONEY PAYING MILLIONS TO THE APKO JEWS? AH anon, no word yet. will have to wait for the french authorities to come out with their investigation. Kalau betul Najib bantai RM500 mil, as you put it, dapat PM baru lah kita. "FBI (Federal Bureau of Investigation) is conducting its 13th National Academy Associates Asia-Pacific conference in MALAYSIA today"
And who would the new prime minister be?? For some of the anons, all comments made is based on pure hatred. There is no point reasoning with them. don,t complaint if people hatred toward u. it their right to hate who ever the dislike @ like. hehehe... do the 'unsangka-able' been 'sangka-able'. These days, all the Anwar gay fans can't evnt defend their idol without ridiculing other party. C'mon gayboys! Where is your defence to all these traitorous deeds Anwar is doing?? frenchkissing with the CIA and the Zionist?? What's your view on Ku Li's comment on current UMNO youth lack of leadership? Looks like he has thrown the gauntlet at KJ. My two cents worth is KJ is a political baggage for PM. UMNO youth under him has not done much to assist PM. Interesting article by Joceline in STAR today. She used to sing praises for him but now without FIL it's a different ball game. makes najis look like a saint... St Najis! "In the meantime, Najib's PMD (Prime Minister Department) was allocated an obsene RM12 billion budget for 2010 which far exceeds the RM8.2 billion allocated for PMD for the entire 5 years of the Eighth Malaysian Plan (2001 - 2005)." Jbss: PM Najib Razak, truth always hurt, isn't it? Just like the euphemism 'money politics' for corruption, no amount of communication and PR spinning (as advised by Apco Worldwide consultants) will help you wash away the sins of this corrupted and racist regime. Only good governance, fair and transparent policies, open-tender system of awarding contracts, the promotion and practice of full accountability, and merit-based policies free from political patronage and race-based considerations, can you hope to gain some credibility for your government. You think Anwar n all politicians sanggup bermatian kena bantai right, left and centre to become PM just because they wanna help the poors? Those were the days my friends.. Being a gay is private matter. Sodomizing a man is a totally different matter. To have a fUture PM like him is total disaster. No matter what ideology you preach NEVER Sell your country. Don't worry he will go down our history as the most disgusting leader. 3 months the most As all his funder became his pointer. Ahaaa.....Malaysia politic seems to stuck in the past. This is akin to Malay proverb " Kuman diseberang laut nampak tapi gajah didepan mata tak nampak"
Yeah...Anwar is losing...finally. All these while, all the Anwaristas are full of praise for Anwar, but now, merapu-merapu tak tentu arah. It's like some losing football team on the field, running out of time, and start kicking the opponents legs, instead of going for the ball...well, Anwar lost his balls to the Neocon, Sekarang teloq dia kena pulas...jangan sesiapa dok kesian kat Anwar...PAS is showing some sign of disengagement with Anwar...good riddance. I'll go back to PAS as soon as PAS denounce Anwar, the chemeleon.